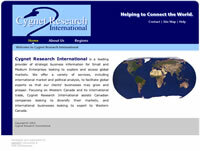 Cygnet Research International is a leading provider of strategic business information for Small and Medium Enterprises looking to explore and access global markets. They offer a variety of services, including international market and political analysis, to facilitate global exports so that clients' businesses may grow and prosper. Focusing on Western Canada and its international trade, Cygnet Research International assists Canadian companies looking to diversify their markets, and international businesses looking to export to Western Canada. This is the professional web site of Dale Throndson for the featuring, promotion, and sales of homes in the city of St. Albert, Alberta. 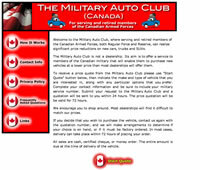 Features custom made "rollover" and animated graphics, as well as customer feedback forms. This is the professional web site of Dale Throndson for the promotion and sale of homes in Alberta. Where serving and retired members of the Canadian Armed Forces, both Regular Force and Reserve, can realize significant price reductions on new cars, trucks and SUVs. Features custom made "rollover" and animated graphics. The Spaetzle Hex (Spaetzle Wizard) is a German-made kitchen utensil, imported for sale in North America, for making fresh spaetzle in your own kitchen. This site is a good example of secure (SSL) online ordering for accepting VISA credit cards. Fish Creek Military Prints is a publisher and distributor of military, historical and limited edition fine art prints. This site is simple in its layout in order to maximize compatability with all browsers, but it incorporates "e-commerce" secure online shopping capability. The Aaltonen family web site and photo album.